Are you looking for a Bank Loan Assumption Agreement? 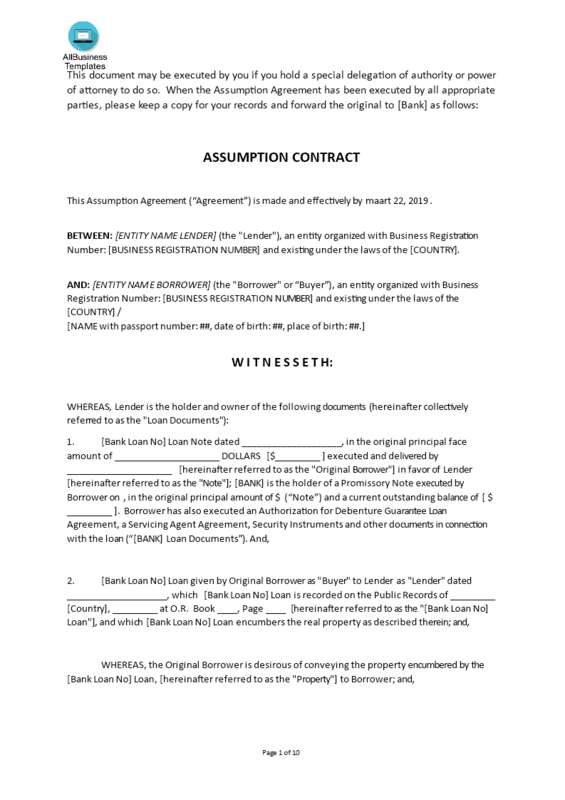 Download this legal Bank Loan Assumption Agreement template now! This Bank Loan Assumption (6 pages) contains the necessary information to set up the Assumption of Bank Loan process. This Agreement template will structures communication between the Bank/Lender and the Borrower in a professional way and covers the most important subjects. We provide a professional Bank Loan Assumption which can be signed between the Bank and Borrower. Please note that the original Bank Loan can be liable for repaying the loan, in the situation that the new owner fails to repay the loan. Assuming a Bank Loan can be risky, and we recommend to consult a lawyer or legal professional for more legal advice. Make sure to keep the original lender in the loop with a wrap-around Bank Loan. This will be necessary to be sure that you are able to get the title. The 3 step process virtually guarantees you can finish and print your legal document in minutes! Completing your legal Loan Assumption Agreement was never simpler! Download this Bank Loan Assumption template and after downloading you will be able to change and customize every detail and appearance. Save yourself time, efforts and probably reduce some of the lawyer-fees! However, we still recommend you to consider consulting a local law firm in case of doubt to support you in this matter. Do you need more? Just search on our website and have instant access to thousands of free and premium legal agreements, contract, documents, forms, letters, etc, which are used by professionals in your industry. For example Real estate forms, Employment forms, General release bank account, Power of attorney, Joint Venture Agreement, Letter of intent, Last will & testament, Secrecy Agreement, Articles of Incorporation of Company, Agreement with Accountant, Purchase contract, Agreement for permission to sublet and much more… All business templates are easy and quick to find, crafted by legal professionals, wisely structured, ready-made and intuitive. Pay closer attention to the template by browsing through the list. Take the time to review and choose the variety of legal templates to suit your need… Good luck!